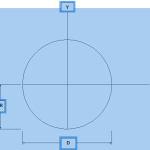 Moment of inertia of a circular section can be calculated by using either radius or diameter of a circular section around centroidal x-axis or y-axis. Find the moment of inertia of a circular section whose radius is 8” and diameter of 16”. Moment of inertia of a circular section is same around both centriodal axis. This is because of symmetry of a section around both axis. Therefore, moment of inertia about centroidal x-axis.